From the “Picture Book of Courtesans”(Keisei ehon) Originally the prints from this series were included in a folding album (orihon). 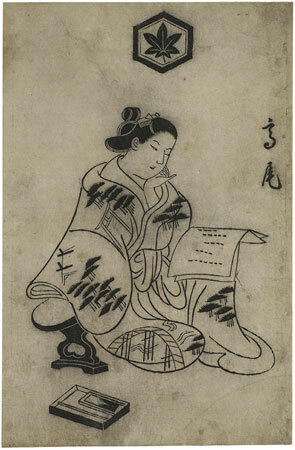 Here the courtesan Takao is sitting lost in thought next to her opened writing box. Her kimono is decorated with elements from a Shintō shrine, a bridge and pine trees. Takao’s crest, a maple leaf, is a reference to the village of Takao near Kyōto, which is still famous for its beautiful maple trees. Hiroshige still depicted this temple near the Azuma-bashi (bridge) in Tokyo with a cuckoo flying over it (series Meisho Edo Hyakkei („Famous views of Edo“), publ. 1856-1859, Sheet no. 55). The cuckoo (hototogisu) has inspired innumerable verses by Japanese poets since the Middle Ages. It is known not only as a bird heralding the coming of Spring, whose song coincides with rice-planting, but also as a symbol of unfaithful love. The cuckoo flies up and away and does not repeat its call again, just as unfaithful love passes once and for all. In the Shidare yanagi Takao is the model used for the courtesan Karahashi (double sheet „ho“).